Ttukbaegi-bulgogi is a stew made from Bulgogi. 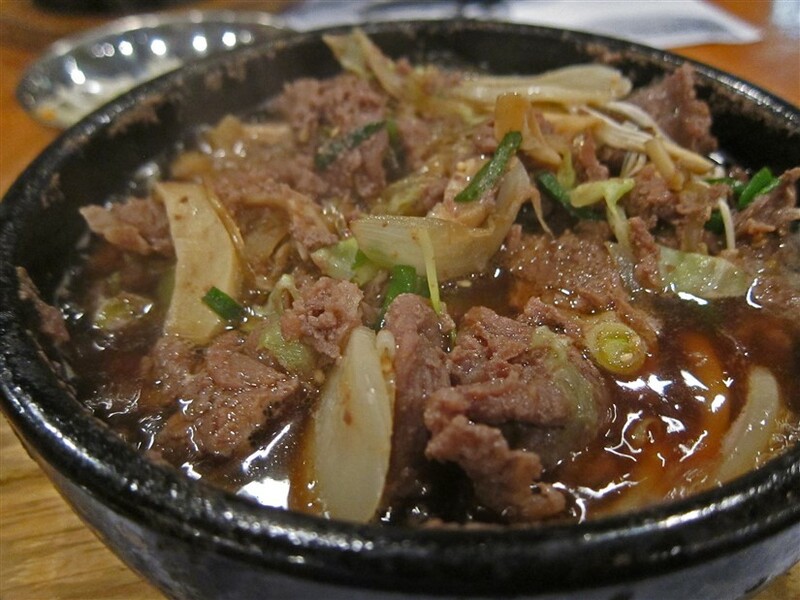 Ttukbaegi-bulgogi literally translates to Clay pot Bulgogi. A ttukbaegi is a korean unglazed earthenware pot made from coarse sand-mud. It can be made from leftover Bulgogi or a newly-made Bulgogi. Ttukbaegi-bulgogi is a quick and easy to make. It is made by placing Bulgogi in a ttukbaegi with water. The meat softens and release juices into the water resulting delicious gravy. Vegetables including carrots, spinach and mushrooms can be added along with noodles. Tofu and green chili peppers can also be added to the gravy. Rice can also be mixed with the gravy or served as a side dish. Garnish with julienned pear or cucumbers and serve in individual plates. The ttukbaegi can also be used to serve the meal.